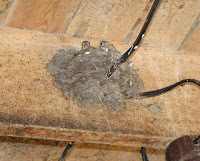 The other nest in the barn belongs to a barn swallow family, whose two chicks peer out of the mud-and-grass construction. The parents are harder to spot, keeping well away when we're anywhere near the nest. I hope they're busy catching black flies, which aren't the aphids that British people think of when they hear those words, but an altogether nastier species of biting insect which is related to the mosquito. We hadn't encountered them before this month and I wouldn't mind if I never met one again. They like running water, so I hope once the streams dry up the supply of black flies will dry up too. I dug up one of the potatoes I'd planted last week, in a spirit of scientific interest. Well, actually I was wondering whether anything was happening underground and couldn't resist having a look. 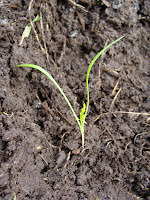 They are busily producing small roots alongside the green sprouts, so things are progressing as they should. This morning's job was to transplant the leeks and Florence fennel. Rain is forecast for the afternoon, so it seemed a sensible time to get on with it, although the leek seedlings are still fairly small. 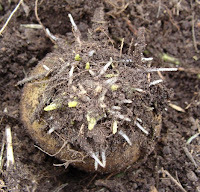 I've not grown fennel bulbs before, so it will be interesting to see how they get on. I haven't bothered putting up a photo of a leek, as they just look like very thin blades of grass. The red cabbage seedlings have completely changed colour since I put them in the ground last week. I wondered if this was a sign of a problem with the plants, but have since discovered that they are a kind of litmus paper and will change colour depending on the alkalinity of the soil (you can even use them to make your own pH indicator juice). As we're sitting on limestone bedrock here, only a couple of feet below the surface, our soil is about as alkaline as it gets. Which is great for cabbages! Ugh. Black flies are so nasty! I hate them more than mosquitoes. As a child I always had scabs all over the back of my neck where they woud crawl under my hair and bite me. Shivers!! I think only horseflies are worse. They're like oversized houseflies and when they bite they take quite a chunk of flesh. Not fun. Hopefully those barn swallows are working double time eating up your bugs! That's interesting about the cabbages. I have no room for anything else at present. If I did, though, I'd grow a few of these around the place, just to see what happened. One of the many impossible things which I wish were possible - would be to have underground cameras that beamed up pictures of what the roots of plants are looking like and doing at any particular moment.